Gunstock is like the Lake Tahoe of the East. You ski from the panoramic summit with magnificent scenery of snowy white mountains and a grand lake below. It’s no Heavenly, but the views of Mount Washington and Lake Winnipesaukee are divine. And what’s not to love about six-minute laps on the base to summit Panorama Quad to ski the entire 1,400 vertical? 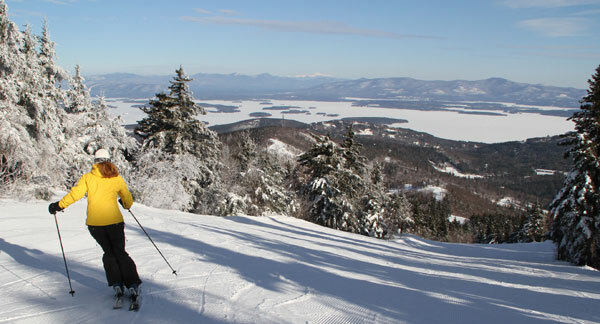 Gunstock started in 1937 with the first chairlift in New England, only the second in the country following Sun Valley Idaho in 1936, a jump and the alpine-style base lodge that still hosts skiers today. My love affair with Gunstock started at age 3, 1969…it was a love for skiing and this lakeside gem at first sight. Don’t be gun shy to take you family to Gunstock, it’s easy to get to, the terrain is ego pleasing, nothing very steep but ever turn is super scenic. Kids will be amped for all 55 ammo laden trail names – like Trigger, Gunsmoke, and Pistol, plus there is a designated Blundersmoke Terrain Park with big hits. Sauntering scenic trails like Flintlock feature perfect white cord, but there area few gritty runs, Hot Shot and Redhat plus recently added glades – Gunsmoke, Recoil and Birch Glades to charge your pulse. Après ski at the Powder Keg Pub is lively in the grand ole base lodge, while your kids night ski on 27 trails or snow tube, half the mountain is lit up for fun. Gunstock Ski Area (previously Belknap Mountain) has come a long way, to eight lifts and 55 trails, from that 1937 original single-chair that served four trails, though it is still uniquely county owned and operated. The Lakes Region ski resort also offers an Aerial Treetop Adventure -the largest high ropes course in New England, and Gunstock Zip Line featuring the longest zip span in the US at 3,981′ and a total descent of 24 football fields – 8,591′ open year round, along with a 4,200′ Mountain Coaster on Mt Rowe by the historic Nordic Ski Jumps . Gunstock’s high speed Panorama Quad to 2,300-feet is far more swift and social than that old single chair. What hasn’t changed in the history of Gunstock skiing since the 1930’s is the families of skiers that gather at Gunstock on winter days and now nights to make their turns, chat with fellow skiers, take in the fresh air and views of the lake, and have some fall-line fun. Ski lodging near Gunstock includes your choice of condos, motels and inns on Lake Winnipesaukee or nearby towns of Gilford, Meredith or Wolfeboro, but Gunstock is also an easy day trip from Boston.